The concept of the ‘social imaginary’ is often invoked and rarely used with any precision or clarity. It still suffers from association with the earlier concept of the ‘spirit of the times,’ or zeitgeist, which carries a lingering cosmological sense that such a spirit is also metaphysical. This essay traces the genealogy of the concept from Jacques Lacan to Charles Taylor. 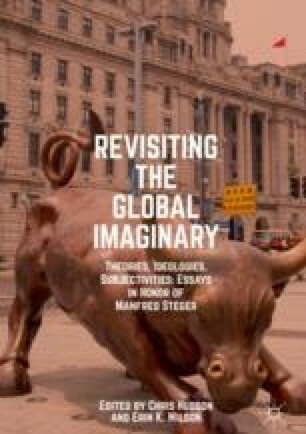 It lays out the case for the approach developed by Manfred Steger as a patterned convocation of the social whole through which people express their social existence. The concept thus provides an elegant way of analyzing social meaning. It best works in relation to and across an integrated set of levels of analysis focusing on ideas, ideologies, imaginaries, and ontologies.